This is the golden MS Project formula. When working with resources, it is essential to understand how MS Project calculates. Duration is the length of working time between the start and finish of a task. MS Project bases the calculation of a task’s duration on the amount of work and the amount of resource units assigned to it. For instance, 80 hours of work done by two people means the task will take 5 days duration (assuming 8hr work days). The working time for a task is defined by the project calendar, resource calendar, task calendar, or any custom calendars you set for a project. Work is the amount of effort, measured in time units (like hours or days), that a resource needs to complete the task. 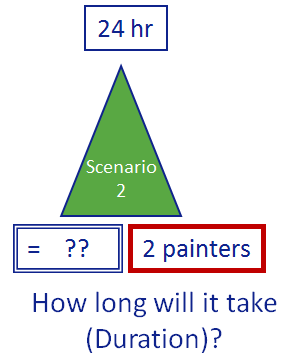 The total work for a task is the sum of all those time units, no matter how many resources are assigned to the task. Think of work as the amount of hours you would be charged for if the resource were an external consultant. This includes toilet breaks, an incidental personal email and daydreaming (gross amount of hours) and does not regard how the hours are spread over the duration of the task. Also note that if you got your work estimates from an internal party, such as a systems architect, you might have received a net estimate of hours (without all the things that make us human). Resource Units indicate how much of a resource’s available time, according to the resource calendar, is being used to work on a particular task. Resources are the people, equipment, or other materials that are applied to completing a task. On a task in the project schedule, resource effort is expressed as units. You can consider units here as the average speed of the task. If you have 100 miles to cover (work), and your average speed is higher (units), you will be there faster (duration). If you have 100 hours of paint work to do, and your average speed is 2 painters, you will be ready faster than with an average speed of 1 painter. Do not mistake resource units for resource availability to the project. Resource availability is a resource feature. ‘Units’ is a task feature. ← How to reschedule all incomplete work with one button? → What happens if I tick the effort driven checkbox?